Walk in the shoes of a local cheesemaker when you get a behind-the-scenes look at Gunn's Hill Artisan Cheese, nestled in the rolling countryside of Oxford County. You'll be greeted with delicious artisan cheese before heading into the stunning aging rooms to learn about how Gunn's Hill crafts unique artisan cheese with recipes developed by cheesemaker Shep Ysselstein while studying in the Swiss Alps. Learn about the heart that goes into each wheel of cheese, and what aging process secrets sets their cheese apart as you wash and flip them and of course, indulge in some too! 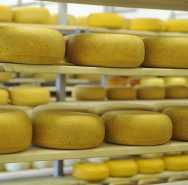 Next, join the cheesemaker to learn how to judge the quality of cheese and understand the various flavor profiles. You'll go head to head with the cheese maker to test your palette and learn to refine it. Finally, wind down this experience by creating three different delicious cheese fondues as a group to enjoy. Each fondue will use a different combination of Gunn's Hill Artisan Cheese.